The calm beside the storm. This morning, I realized that I missed my own blog's second birthday--five days ago. You've probably already gotten the sense that Things are Happening over here, but if you haven't, well: they are. People are coming and going, and some of the people who have gone have opened up spaces in my head that some of the people who have come are now filling up in unexpected ways. Add to that the fact that we're at a solstice, and you'll grasp why my world feels a little upside down. Add to that the fact that my whole family will be together in just over 48 hours. Add to that the fact that it's the holiday season, and that yesterday I scored an evening dress for £42 and promptly wore it to a feast, in true glamour girl style. It doesn't feel like time for a break just yet, and yet a break seems to have walked up and greeted me, and who am I, after all these years, to nay-say? I haven't even made it out to take pictures in days--because, in addition to all the other topsy-turviness of this week, we've barely seen the sun. 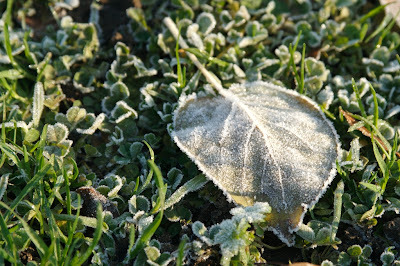 This frosted leaf is from last Tuesday--as in, 12 December. This morning, all the trees outside my building were frosted, and had it not been so delicious to stand at the window in my paisley pajamas, eating breakfast pie and drinking my morning coffee, I might have gone out to harvest some images. But it was delicious to cozy in my own space. Perhaps tomorrow, I'll recommit to art. But even that misrepresents what I've been up to: today I cracked into Bach's Three-Part Inventions, and my heart beat faster. Which is to say, even faster.